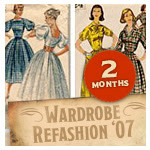 I lurked on the Wardrobe Refashion ’06 blog from the time it began. I was completely smitten with the concept – just didn’t think I had the chops to pull it off. Now that I’m feeling a little more adept at the sewing machine and am, in fact, getting as obsessed with possible sewing projects as I am with knitting projects, I’ve decided I think I can do this. So when Wardrobe Refashion ’07 was unveiled, I jumped in. I only took the 2-month pledge for starters (there are also 4-month and 6-month options), but I can always re-up. I, earthchick, pledge that I shall abstain from the purchase of “new” manufactured items of clothing, for the period of 2 months. I pledge that I shall refashion, renovate, recycle preloved items for myself with my own hands in fabric, yarn or other medium for the term of my contract. I pledge that I will share the love and post a photo of my refashioned, renovoated, recylcled, crafted or created item of clothing on the Wardrobe Refashion blog, so that others may share the joy that thy thriftyness brings! Isn’t it a cool concept? I’m way excited! And of course, my “to make” list is longer than ever, since I’m planning on doing this not only for myself but also for the boys. (I think My Old Man is well-enough covered clotheswise for now). Of course, it’s not like I would ordinarily be buying a ton of clothes in just a two-month timeframe (now if I had done the 4-month, that would’ve been a bigger challenge, what with the warmer weather arriving and the boys probably needing new sizes in warm weather clothing). The main thing for me is that Easter is coming up, and I hope to craft Easter outfits for the boys and me. edited to add: Check out this contest. Thanks to schrodinger for putting out the word. That is a tres cool concept. Now if only I had a wardrobe big enough to hold all those old clothes to refashion, they get donated to make room for the new 😦 Can’t wait to see what refashions you get up to. Wow, that’s a challenge that I don’t even begin to have the skills to take on. But what a good one if you can manage it! Good luck! By the way, I saw you won Dave’s contest over at Criminy Jickets (I suppose it’s possible I’m giving away your knitting news for your next post) — congratulations! Your recent contest must have generated some good karma for you.